Chag same’ach to you all and shabbat shalom. in the mosaic floor of the synagogue of Hamat Tveria (Tiberias), dated from 6th century BCE 4th century BCE 1st century BCE 1st century CE 4th century CE a long, long time ago. afaik, the earliest structures unearthed in israel that are generally accepted by archaeologists to be synagogues date to only around the 1st century BCE. I believe the correct date for the ancient Hamat synagogue in Tiberias is around the 4th century CE. Here: according to the Israel Foreign Ministry, the earliest synagogue uncovered by archaeologists dates to the 1st Century BCE. right. which is why the caption that says it dates to the “6th century BCE” is a typo. Hmmm, tough one. The Foreign Ministry does qualify its info by specifying that this synagogue is the earliest Second Temple synagogue that has been discovered. I wonder whether they’re excluding earlier synagogues. Back to Google I went and looked up Hamat Tiberias. I came up with this. The synagogue at Hamat Tiberias had a long and varied history. The remains, on view today, belong to the Severus synagogue, built between 337 and 286 B.C.E., the period when the Sanhedrin (assembly of 71 ordained scholars, which served as both as legislature and as supreme court) met in Tiberias. It draws its name from one of the Greek inscriptions found here. 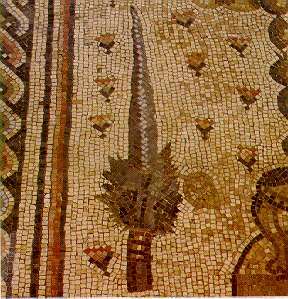 The most beautiful feature of the synagogue is the mosaic floor, the oldest discovered in Israel. Other Google links, however, claim this is 4th Century CE (well, they say AD, but you and I will call it CE). Do we have anybody here who can assist with this question? ™ : AFAIK, there won’t be any First Temple era synagogues, as the need for a mobile and distributed location for communal worship was formulated during the Exile between the First and Second Temples, when the Jews were in Babylon. …not all the Israelites or Judeans were in exile in Babylon. In fact, there were always ongoing ties between the two communities. ™ : My understanding was that after the calamity surrounding the assassination of Gedaliah, the remaining organized Jewish communities of Judah were dispersed, initially fleeing to Egypt. At least that is what I read in Yermiahu, chapter 43. I’m curious to know if there’s further Jewish sources commenting on organized Jewish life in Eretz Israel during the Babylonian exile? What a wonderful picture. Thank you for posting it. I get the idea. It looks just like ours. Oh boy, oh boy. What an honor and joy to be part of something so very, very old. 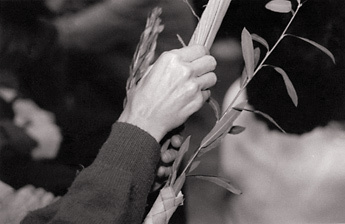 I meant, this Lulav – Etrog set looks just like the one on my kitchen table right now.